TAU Prof. Dan Peer explains how TAU is addressing today’s health concerns with nano-medicine. Brazilian Friends of Tel Aviv University hosted TAU professor Dan Peer, Director of the Laboratory of Precision Medicine at the George S. Wise Faculty of Life Sciences, at an event presenting TAU’s innovative medical research to Brazilian medical professionals, researchers, academics and students. Prof. Peer offered an informative lecture at Albert Einstein Israelite Hospital in São Paulo, one of the leading hospitals in South America Prof. Peer, who is spearheading a new initiative in translational medicine at TAU, spoke on “Turning Academic Discoveries into Novel Therapeutic Modalities.” President of Albert Einstein Hospital, Sidney Klajner, expressed an interest in developing an ongoing partnership with TAU. 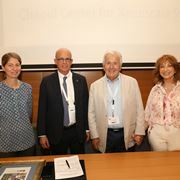 “We’d like to bring TAU researchers to Albert Einstein and send groups of our doctors to TAU’s Lahav Executive Education of Coller School of Management for organizational management courses,” said Klajner. Andre Chusyd, representative of TAU International, informed the students about TAU’s diverse undergraduate programs in English. He presented a video about the Brazilian Scholarship Fund, which awards stipends to Brazilian students wishing to study at TAU.